L. Pezzè, M. Gabbrielli, L. Lepori and A. Smerzi, Multipartite entanglement in topological quantum phases, Physical Review Letters 119, 250401 (2017). M. Gessner, L. Pezzè and A. Smerzi, Entanglement and squeezing in continuous-variable systems, Quantum 1, 17 (2017). L. Pezzè, M. A. Ciampini, N. Spagnolo, P. C. Humphreys, A. Datta, I. A. Walmsley, M. Barbieri, F. Sciarrino and A. Smerzi, Optimal measurements for simultaneous quantum estimation of multiple phases, Physical Review Letters 119, 130504 (2017). G. Spagnolli, G. Semeghini, L. Masi, G. Ferioli, A. Trenkwalder, S. Coop, M. Landini, L. Pezzè, G. Modugno, M. Inguscio, A. Smerzi and M. Fattori, Crossing Over from Attractive to Repulsive Interactions in a Tunneling Bosonic Josephson Junction, Physical Review Letters 118, 230403 (2017). P. Buonsante, R. Franzosi and A. Smerzi, Phase transitions at high energy vindicate negative microcanonical temperature, Physical Review E 95, 052135 (2017). M. Gessner, L. Pezzè and A. Smerzi, Resolution-enhanced entanglement detection, Physical Review A 95, 032326 (2017). A. Abdelrahman, O. Khosravani, M. Gessner, H.-P. Breuer, A. Buchleitner, D. J. Gorman, R. Masuda, T. Pruttivarasin, M. Ramm, P. Schindler and H. Häffner, Local probe of single phonon dynamics in warm ion crystals, Nature Communications 8, 15712 (2017). M. M. Müller, S. Gherardini and F. Caruso, Quantum Zeno Dynamics through stochastic protocols, Annalen Der Physik 529, 1600206 (2017). P. Buonsante, R. Franzosi and A. Smerzi, On the dispute between Boltzmann and Gibbs entropy, Annals of Physics 375, 414 (2016). M. Gessner, L. Pezzè and A. Smerzi, Efficient entanglement criteria for discrete, continuous, and hybrid variables, Physical Review A 94, 020101(R) (2016). S. Gherardini, C. Lovecchio, M. M. Müller, P. Lombardi, F. Caruso and F. S. Cataliotti, Ergodicity in randomly perturbed quantum systems, arXiv:1604.08518 (2016). I. Kruse, K. Lange, J. Peise, B. Lücke, L. Pezzè, J. Arlt, W. Ertmer, C. Lisdat, L. Santos, A. Smerzi and C. Klempt, Improvement of an Atomic Clock using Squeezed Vacuum, Physical Review Letter 117, 143004 (2016). T. Wasak, A. Smerzi and J. Chwedenczuk, Role of Particle Entanglement in the Violation of Bell Inequalities, arXiv:1609.01576 (2016). M. M. Müller, S. Gherardini and F. Caruso, Stochastic quantum Zeno-based detection of noise correlations, Nature Sci. Rep. 6, 38650 (2016). S. Viciani, S. Gherardini, M. Lima, M. Bellini and F. Caruso, Disorder and dephasing as control knobs for light transport in optical fiber cavity networks, Nature Sci. Rep. 6, 37791 (2016). R. Franzosi, D. Felice, S. Mancini and M. Pettini, Riemannian-geometric entropy for measuring network complexity, Phys. Rev. E 93, 062317 (2016). M. M. Müller, S. Gherardini, A. Smerzi and F. Caruso, Fisher information from stochastic quantum measurements, Phys. Rev. A 94, 042322 (2016). F. Caruso, A. Crespi, A. G. Ciriolo, F. Sciarrino and R. Osellame, Fast Escape of a Quantum Walker from an Integrated Photonics Maze, Nature Communications 7, 11682 (2016). H. Park, N. Heldman, P. Rebentrost, L. Abbondanza, A. Iagatti, A. Alessi, B. Patrizi, M. Salvalaggio, L. Bussotti, M. Mohseni, F. Caruso, H. C. Johnsen, R. Fusco, P. Foggi, P. F. Scudo, S. Lloyd and A. M. Belcher, Enhanced energy transport in genetically engineered excitonic networks, Nature Materials 15, 211 (2016). T. Macrì, A. Smerzi and L. Pezzè, Loschmidt echo for quantum metrology, Physical Review A 94, 010102(R) (2016). M. Gessner, V. M. Bastidas, T. Brandes, and A. Buchleitner, Semiclassical excited-state signatures of quantum phase transitions in spin chains with variable-range interactions, Physical Review B 93, 155153 (2016). A. Trenkwalder, G. Spagnolli, G. Semeghini, S. Coop, M. Landini, P. Castilho, L. Pezzè, G. Modugno, M. Inguscio, A. Smerzi and M. Fattori, Observation of Quantum Phase Transitions with Parity-Symmetry Breaking and Hysteresis, Nature Physics 12, 826 (2016). I. Donato, M. Gori, M. Pettini, G. Petri, S. De Nigris, R. Franzosi and F. Vaccarino, Persistent homology analysis of phase transitions, Physical Review E 93, 052138 (2016). M. Gori, R. Franzosi and M. Pettini, On the apparent failure of the topological theory of phase transitions, arXiv:1602.01240. A. Streltsov, H. Kampermann, S. Wölk, M. Gessner and D. Bruß, Maximal Coherence and the Resource Theory of Purity, arXiv:1612.07570 (2016). S. Gherardini, S. Gupta, F. S. Cataliotti, A. Smerzi, F. Caruso and S. Ruffo, Stochastic Quantum Zeno by Large Deviation Theory, New Journal of Physics 18, 013048 (2016). D. Y. Fedyanin and M. Agio, Ultrabright single-photon source on diamond with electrical pumping, arXiv:1602.04394. M. Gessner and A. Buchleitner, On the reduced dynamics of a subset of interacting bosonic particles, arXiv:1607.07211 (2016). C. Lovecchio, A. Schäfer, S. Cherukattil, M. Alì Khan, I. Herrera, F. S. Cataliotti, T. Calarco, S. Montangero and F. Caruso, Optimal preparation of quantum states on an atom-chip device, Physical Review A 93, 010304(R) (2016). E. G. Carnio, A. Buchleitner and M. Gessner, Generating and protecting correlated quantum states under collective dephasing, New J. Phys. 18, 073010 (2016). S. Pelisson, L. Pezzè and A. Smerzi, Nonlocality with ultracold atoms in a lattice, Physical Review A 93, 022115 (2016). F. Caruso, A. Crespi, A. G. Ciriolo, F. Sciarrino and R. Osellame, Fast escape of a quantum walker from an integrated photonic maze, Nature Communications 7, 11682 (2016). G. Valtolina, A. Burchianti, A. Amico, E. Neri, K. Xhani, J. A. Seman, A. Trombettoni, A. Smerzi, M. Zaccanti, M. Inguscio and G. Roati, Josephson effect in fermionic superfluids across the BEC-BCS crossover, Science 350, 1505 (2015). L. Pezzè, Y. Li, W. Li and A. Smerzi, Witnessing Multipartite Entanglement without Entanglement Witness Operators, Proceedings of the National Academy of Sciences 113, 11459 (2016). J. Peise, I. Kruse, K. Lange, B. Lücke, L. Pezzè, J. Arlt, W. Ertmer, K. Hammerer, L. Santos, A. Smerzi and C. Klempt, Satisfying the Einstein-Podolsky-Rosen criterion with massive particles, Nature Communications 6, 8984 (2015). J. Peise, B. Lücke, L. Pezzé, F. Deuretzbacher, W. Ertmer, J. Arlt, A. Smerzi, L. Santos and C. Klempt, Interaction-free measurements by quantum Zeno stabilization of ultracold atoms, Nature Communications 6, 6811 (2015). G. Sorelli, L. Pezzè and A. Smerzi, Fast generation of entanglement in Bosonic Josephson Junctions, arXiv:1511.01835. S. Lagomarsino, F. Gorelli, M. Santoro, N. Fabbri, A. Hajeb, S. Sciortino, L. Palla, C. Czelusniak, M. Massi, F. Taccetti, L. Giuntini, N. Gelli, D. Y. Fedyanin, F. S. Cataliotti, C. Toninelli and M. Agio, Robust luminescence of the silicon-vacancy center in diamond at high temperatures, AIP Advances 5, 127117 (2015). M. A. Ciampini, N. Spagnolo, C. Vitelli, L. Pezzè, A. Smerzi and F. Sciarrino, Quantum-enhanced multiparameter estimation in multiarm interferometers, arXiv:1507.07814. L. Pattelli, G. Mazzamuto, D. Wiersma and C. Toninelli, Diffusion of light in semitransparent media, arXiv:1509.04030. C. Lovecchio, S. Cherukattil, B. Cilenti, I. Herrera, F. S. Cataliotti, S. Montangero, T. Calarco and F. Caruso, Quantum state reconstruction on Atom-Chips, New Journal of Physics 17, 093024 (2015). M. Gabbrielli, L. Pezzé and A. Smerzi, Spin-mixing Interferometry with Bose-Einstein Condensates, Physical Review Letters 155, 163002 (2015). G. Kordas , D. Witthaut, P. Buonsante, A. Vezzani, R. Burioni, A. I. Karanikas and S. Wimberger, The dissipative Bose-Hubbard model, The European Physical Journal Special Topics 224, 2127 (2015). S. Viciani, M. Lima, M. Bellini and F. Caruso, Observation of Noise-Assisted Transport in an All-Optical Cavity-Based Network, Physical Review Letters 115, 083601 (2015). R. Franzosi, D. Felice, S. Mancini and M. Pettini, A geometric entropy detecting the Erdös-Rényi phase transition, Europhysics Letters 111, 20001 (2015). P. Buonsante, L. Pezzé and A. Smerzi, Interacting bosons in a disordered lattice: Dynamical characterization of the quantum phase diagram, Physical Review A 91, 031601(R) (2015). G. Mazzamuto, A. Tabani, S. Pazzagli, S. Rizvi, A. Reserbat-Plantey, K. Schädler, G. Navickaité, L. Gaudreau, F. S. Cataliotti, F. Koppens and C. Toninelli, Single-molecule study for a graphene-based nano-position sensor, New Journal of Physics 16, 11300 (2014). D. Martín-Cano, H.R. Haakh, K. Murr and M. Agio, Large Suppression of Quantum Fluctuations of Light from a Single Emitter by an Optical Nanostructure, Physical Review Letters 113, 263605 (2014). 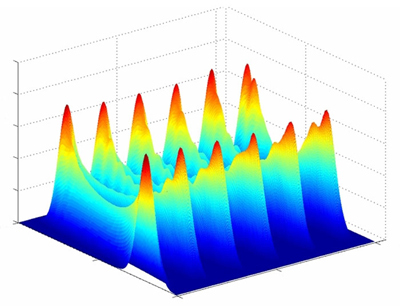 M. Abad, M. Guilleumas, R. Mayol, F. Piazza, D. M. Jezek, and A. Smerzi, Phase-slips and vortex dynamics in Josephson oscillations between Bose-Einstein condensates, arXiv:1409.5598 (2014). M. Agio, Nanophotonics and quantum optics, Transparent Optical Networks (ICTON) 2014, 1-4, IEEE, DOI: 10.1109/ICTON.2014.6876376. H. Strobel, W. Muessel, D. Linnemann, T. Zibold, D. B. Hume, L. Pezzè, A. Smerzi, M. K. Oberthaler, Fisher information and entanglement of non-Gaussian spin states, in Science 345, 424 (2014). W. Li, T. He, and A. Smerzi, Multimode Kapitza-Dirac Interferometry with Trapped Cold Atoms, Physical Review Letters 113, 023003 (2014). R. Franzosi and R. Vaia, Newton's cradle analogue with Bose– Einstein condensates, http://www.2physics.com (06/2014). D. Martin Cano, H.R. Haakh, K. Murr and M. Agio, Large suppression of quantum fluctuations of light from a single emitter by an optical nanostructure, arXiv:1405.15951 (2014). G. Gualdi, D. Licht, D. M. Reich and C. P. Koch, Efficient Monte Carlo characterization of quantum operations for qudits, arXiv:1404.1608 (2014). R. Franzosi and R. Vaia, Newton's cradle analogue with Bose– Einstein condensates, Journal of Physics B 47, 095303 (2014). J. Bravo-Abad, F. Garcia-Vidal, D. Martin Cano and R. Quesada, Deep-subwavelength negative-index waveguiding enabled by coupled conformal surface plasmons, Optics Letters 39, 207122 (2014). D. M. Reich, G. Gualdi and C. P. Koch, Optimal qudit operator bases for efficient characterization of quantum gates, arXiv:1403.7154 (2014). F. Schäfer, I. Herrera, S. Cherukattil, C. Lovecchio, F. S. Cataliotti, F. Caruso and A. Smerzi, Experimental realization of quantum zeno dynamics, Nature Communications 5, 3194 (2014). F. S. Cataliotti, A. Smerzi and M. Inguscio, Centro di Ricerca Congiunto fra MPQ-UNIFI-IIT-LENS QSTAR - “Quantum Science and Technology in Arcetri”, Il Colle di Galileo 2, n. 1 (2013). F. Caruso, Quantum Transport in Light-Harvesting Bio-Nanostructures, Il Colle di Galileo 2, n. 1 (2013). C. Arenz, G. Gualdi and D. Burgarth, Control of open quantum systems: a case study of the central spin mode, arXiv: 1312.0160 (2013). D. M. Reich, G. Gualdi and C. P. Koch, Optimal Strategies for Estimating the Average Fidelity of Quantum Gates, Physical Review Letters 111, 200401 (2013). T. Wasak, J. Chwedenczuk, L. Pezzé and A. Smerzi, Optimal measurements in phase estimation: simple examples, arXiv:1310.2844 (2013). M. Agio and D. Martin Cano, The Purcell factor of nanoresonators, Nature Photonics 7, 674 (2013). X.-W. Chen, A. Mohammadi, A. Hossein Baradaran Ghasemi and M. Agio, Ultrafast coherent nanoscopy, Molecular Physics 111, 3003 (2013). M. Cramer, A. Bernard, N. Fabbri, L. Fallani, C. Fort, S. Rosi, F. Caruso, M. Inguscio and M. B. Plenio, Spatial entanglement of bosons in optical lattices, Nature Communications 4, 2161 (2013). S. Hoyer, F. Caruso, S. Montangero, M. Sarovar, T. Calarco, M. B. Plenio and K. B. Whaley, Realistic and veriﬁable coherent control of excitonic states in a light harvesting complex, arXiv:1307.4807 (2013). P. Buonsante, L. Orefice, and A. Smerzi, Dynamic phase diagram for the quantum phase model, Phys. Rev. A 87, 063620 (2013). F. Piazza, L. A. Collins and A. Smerzi, Critical velocity for a toroidal Bose–Einstein condensate flowing through a barrier, Journal of Physics B 46, 095302 (2013). J. Chwedenczuk, F. Piazza and A. Smerzi, A Multi-path Interferometer with Ultracold Atoms Trapped in an Optical Lattice, Physical Review A 87, 033607 (2013). C. D'Errico, M. Moratti, E. Lucioni, L. Tanzi, B. Deissler, M. Inguscio, G. Modugno, M. B. Plenio and F. Caruso, Quantum diffusion with disorder, noise and interaction, New Journal of Physics 15, 045007 (2013). S. Iubini, R. Franzosi, R. Livi, G.-L. Oppo and A. Politi, Discrete breathers and negative-temperature states, New Journal of Physics 15, 23032 (2013). F. Caruso, V. Giovannetti, C. Lupo and S. Mancini, Quantum channels and memory effects, arXiv:1207.5435. F. Logiurato and A. Smerzi, Born Rule and Noncontextual Probability, Journal of Modern Physics 3, 1802 (2012). P. Buonsante, R. Burioni, E. Vescovi and A. Vezzani, Quantum criticality in a bosonic Josephson junction, Physical Review A 85, 043625 (2012). A. Smerzi, Zeno Dynamics, Indistinguishability of State, and Entanglement, Physical Review Letters 109, 150410 (2012). L. Pezzè, A. Smerzi, M. K. Oberthaler, R. Schmied and P. Treutlein, Non-classical states of atomic ensembles: fundamentals and applications in quantum metrology, arXiv:1609.01609 (2016). M. Gessner, H.-P. Breuer and A. Buchleitner, The local detection method: Dynamical detection of quantum discord with local operations, in F. Fanchini, D. Soares Pinto, G. Adesso (eds), Lectures on General Quantum Correlations and their Applications. Quantum Science and Technology, Springer, Cham (2017). G. Kordas , D. Witthaut, P. Buonsante, A. Vezzani, R. Burioni, A. I. Karanikas and S. Wimberger, The dissipative Bose-Hubbard model, The European Physical Journal Special Topics 224, 2127, (2015). F. Caruso, V. Giovannetti, C. Lupo and S. Mancini, Quantum channels and memory effects, Reviews of Modern Physics 86, 1203 (2014). Manuel Gessner, Dynamics and characterization of composite quantum systems, Springer Thesis Series, Springer International Publishing, ISBN: 978-3-319-44458-1 (Print) 978-3-319-44459-8 (Online). Luca Pezzé and Augusto Smerzi, Quantum theory of phase estimation, in Atom Interferometry, Proceedings of the International School of Physics “Enrico Fermi”, Course 188 (Societa' Italiana di Fisica, Bologna and IOS Press, Amsterdam), edited by G. M. Tino and M. A. Kasevich.